Newcomb Spring Corp., Decatur, GA, has developed a camera gauge setup that provides precise, image-based length measurements, with data recording and reportable order details. The system measures compression springs during manufacture, capturing and saving a digital image of each part and recording part dimensions. 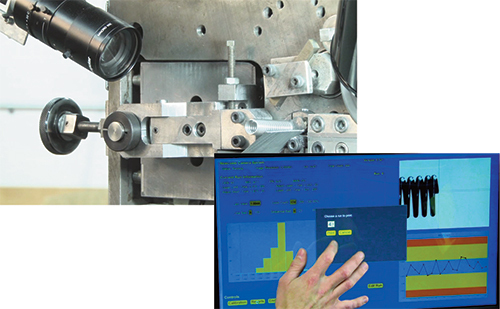 If part measurements approach maximum tolerance levels, software automatically triggers an adjustment in connected wire-coiling machinery, causing the equipment to recalibrate and comply more closely to nominal specifications. Upon order completion, a report and digital record is available for download. With its high-speed, automated operations, the Newcomb Camera System allows the company to efficiently produce precise compression springs and to provide a complete production report, accounting for all parts manufactured. With a high-resolution 10X macro camera lens, the system compares dimensional image data to a preset tolerance range and rejects parts falling outside of that range, sorting them into holding bins. At the end of the run, Newcomb operators count rejected parts and compare the count to the system’s report, confirming all data is correct. We were impressed by how quickly the monitor and the camera start up when the car is turned on and shifted into reverse, especially for a $100 piece of tech. The image is very clear (even at a 3-inch screen size), and the camera performs well in both high- and low-light situations.